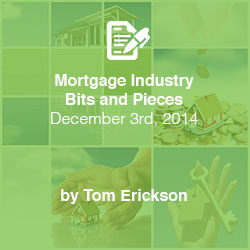 The Federal Housing Finance Agency (FHFA) has come out with the 2015 County loan limits for the GSEs. It has retained the base conforming loan amount of $417,000 for single family dwellings, the differences are for the high cost areas. FHFA reported that 46 counties across the country did have their county limits raised for 2015, the remaining high cost areas remained at the 2014 level. A complete list of the changes can be found on the FHFA website. This proposed new fee responds to a request in the Administration FY 2015 budget to levy a fee on lenders in order to fund an enhanced quality improvement program for single-family FHA insured loans. As currently written in the Transportation, HUD and Related Agencies Appropriations bill S. 2438, it would authorize the Secretary of Housing and Urban Development (HUD) to retroactively assess a per loan fee on FHA single family mortgage insurance program lenders. The fee’s intended purpose is to update the IT systems and enhance the quality assurance program for single-family loans. The 4bps per loan would provide HUD roughly $30 Million/yr. in estimated revenue to fund this expenditure. The feedback from most lenders is that the fee would become a “federal tax” on home ownership since most likely this fee would be passed on to the borrower. The Section 184 Indian Housing Loan Guarantee program (Section 184 program) provides access to sources of private financing for Indian families, Indian housing authorities, and Indian tribes that otherwise could not acquire housing financing because of the unique legal status of Indian land, by guaranteeing loans to eligible persons and entities. Over the last 5 years, the Section 184 program has doubled the number of loans and eligible families being assisted by the program. For HUD to continue to meet the increasing demand for participation in this program, HUD is exercising its new statutory authority to implement an annual premium to the borrower in the amount of 0.15 percent of the remaining loan balance until the unpaid principal balance, excluding the upfront loan guarantee fee, reaches 78 percent of the lower of the initial sales price or appraised value based on the initial amortization schedule. Effective November 15, 2014, the new annual premium of 0.15 percent of the remaining loan balance will apply to all new loan guarantees, including refinances. This notice also provides guidance on the cancellation of the annual premium when the loan reaches the 78 percent loan-to-value ratio.